An art embracing the mind, body, and spirit, there is an increasing evidence base for Tai Chi in alleviating the symptoms of many health issues. Tai Chi is widely known in eastern medicine for its health benefits, including increased strength and flexibility, peace of mind, lower blood pressure, and improved posture. Tai Chi concentrates on relieving the physical effects of stress on the body and mind. Unlike most types of exercise, Tai Chi does not rely on strength, force or speed, making it an ideal exercise for just about everyone. According to the National Institute of Health, research findings suggest that practicing Tai Chi may improve balance and stability in people with Parkinson’s and other movement disorders. The term “movement disorder” refers to a neurological condition causing abnormal movements. Movement disorders can cause both fast/jerky and slowed movements, which may be voluntary or involuntary. Common types of movement disorders include Parkinson’s Disease, Multiple Sclerosis (MS), and essential tremor. Researchers from Harvard Medical School, The National Tremor Foundation, the Oregon Research Institute, and MSFocus.org have found that patients with movement disorders can benefit greatly from practicing Tai Chi. In addition, Tai Chi may reduce pain from knee osteoarthritis, help people cope with fibromyalgia and back pain, and promote quality of life and mood in people with heart failure and cancer. Integrated Therapies at Valley View recognized the need for patients with movement disorders to practice physical movement in a safe and encouraging environment. 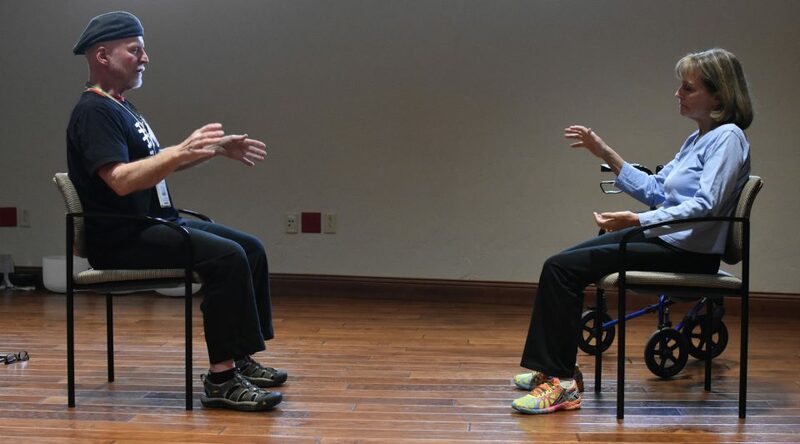 The Tai Chi for Movement Disorders class was launched in 2017 with help from the Valley View Foundation, who subsidizes the cost of the program for patients diagnosed with movement disorders. For both Anderson and Teich, perhaps the most beneficial aspect of the class is the ability to connect with others. “Just knowing that someone else is going through something similar is heartening. If she can show up than so can I,” Anderson says. Tai Chi for Movement Disorders is a weekly class, meeting Mondays and Wednesdays from 2:30 to 3:30 p.m. in the Mindful Movement Studio in Integrated Therapies at Valley View. Participants with a diagnosed movement disorder may participate in the class at no cost, due to the generosity of donors from the Valley View Foundation. For more information, call Shelby Keys at 970.384.6953. Interested in Tai Chi, but do not have a diagnosed movement disorder? HealthQuest at Valley View offers a six-week Tai Chi/Qigong program for balance and fall prevention. For more information call Lydia Senn at 970.384.7566.